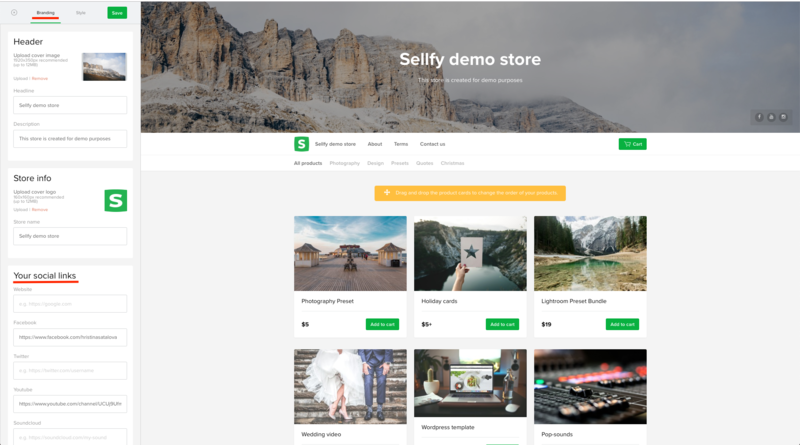 Click "Sign up" on Sellfy.com to register a seller's account. Verify your email address by pressing the "Verify my email address" button in the email you received from us. Note: All accounts have to go through the email verification process. If you haven't received a verification email, you can send out a new one in the Account Settings by clicking on the "Resend verification" button next to the email entry field. If the email doesn't arrive even then, make sure you've entered your email address correctly and check the spam folders as well. Note: make sure the information you provide on your Sellfy account is clear and on point. Starting with a catchy username to describing your products, your customers need to know that they can trust you and understand what they are buying. Select Store settings → Store pages and add relevant information about your store in the 'About' and 'Terms' pages. Select Purchase Email to edit your "Thank you email" that will go out to your buyers after each purchase. Note: Before you start selling, you need to make sure you have a fully functioning PayPal account and you need to integrate it with your Sellfy account. Otherwise, your customers won't be able to buy anything from you. Go to Payment Settings and choose your primary account currency and enter your PayPal email address and/or Stripe keys. Here's more information on how to add PayPal to your Sellfy account. Here's more information on how to add Stripe to your Sellfy account. Enter your social media links as shown in the examples.